This post is sponsored by Mirum. 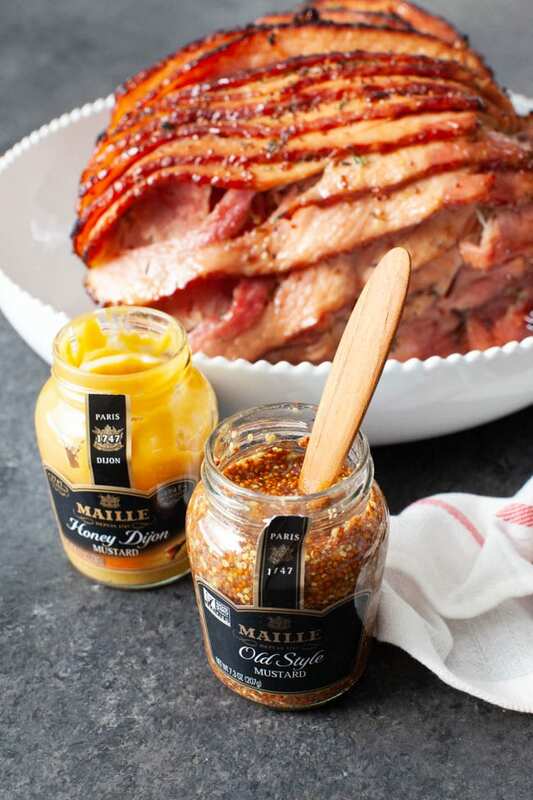 I’m excited to be working with Mirum again to bring you this recipe showing you how to cook a ham in a slow cooker using Maille® Honey Dijon Mustard and Maille® Old Style Mustard! It’s really easy and all of the ingredients, you can buy them all at Walmart! 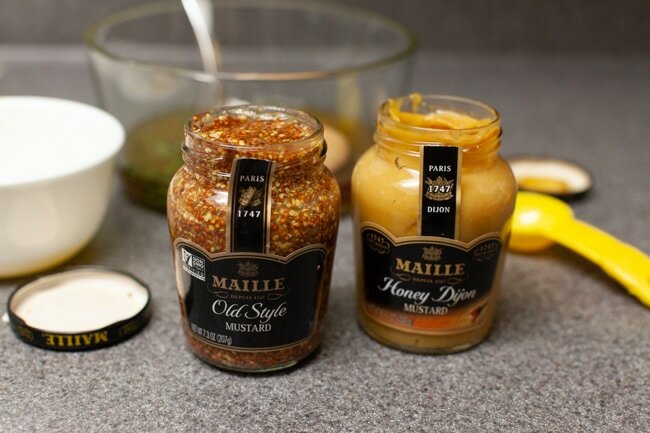 Maille Mustard is pronounced “My” Mustard. That’s cool, isn’t it? 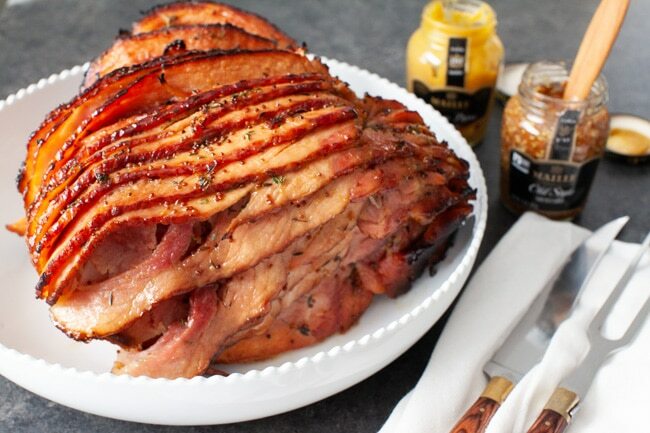 I have always wanted to try to make a spiral cut ham in a slow cooker with a honey mustard glaze. Let me just say it turned out amazing! I used Maille Honey Dijon Mustard and Maille Old Style Mustard. It was a perfect combination of the mustards along with the honey, melted butter, brown sugar and fresh thyme. 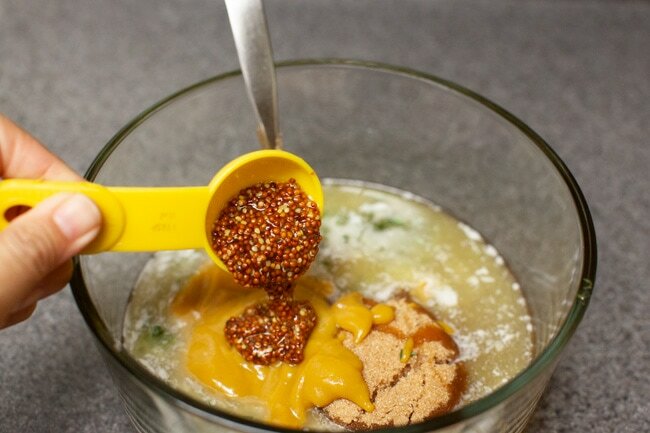 The sweet and salty from the honey dijon mustard and the crisp whole seeds from the old style mustard made both mustards essential to this recipe and of course it tastes great! 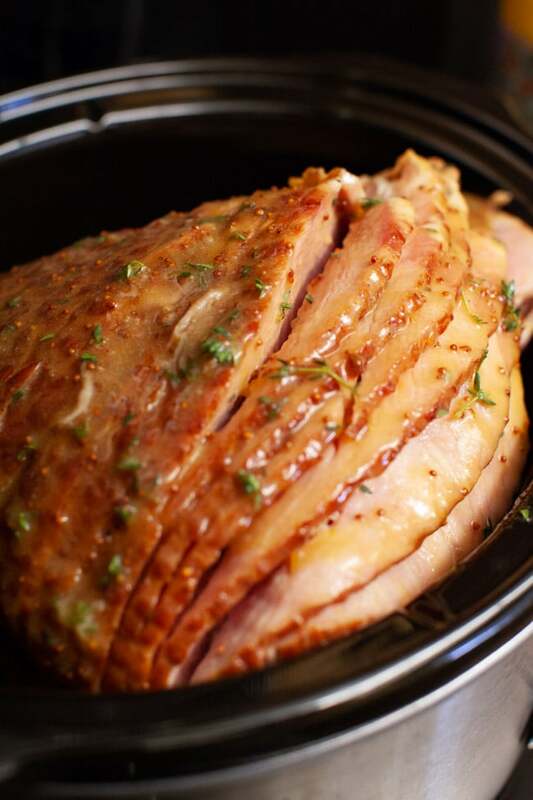 This Easter, make this crockpot ham recipe for your family and friends, they will LOVE it! 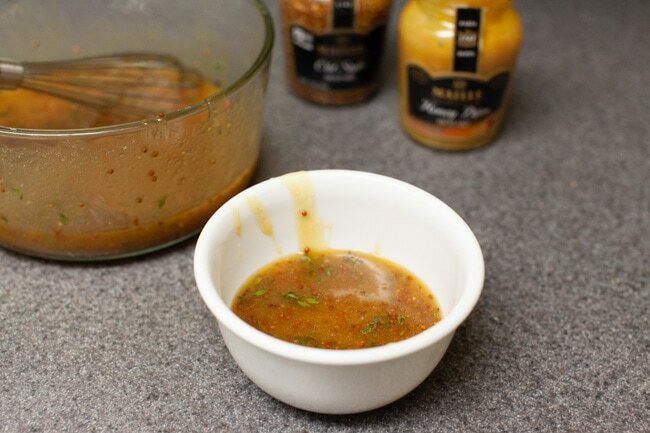 Using Maille mustards in this recipe just elevates the whole dish and makes it so special. And cooking it in the slow cooker made it so easy! First, take all of the ingredients except the ham and mix together in a small bowl. 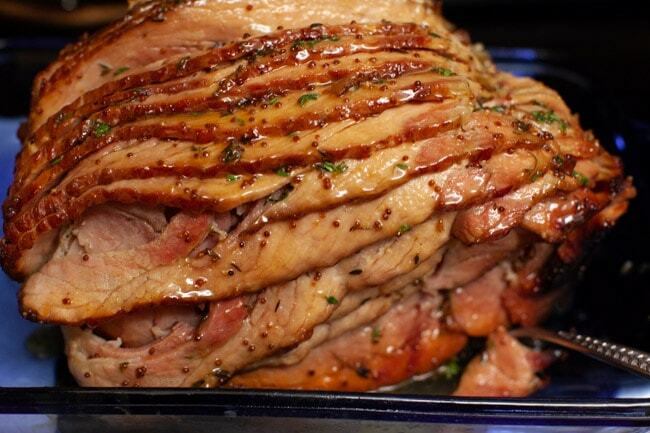 It takes just a couple of minutes to make the glaze for this ham! 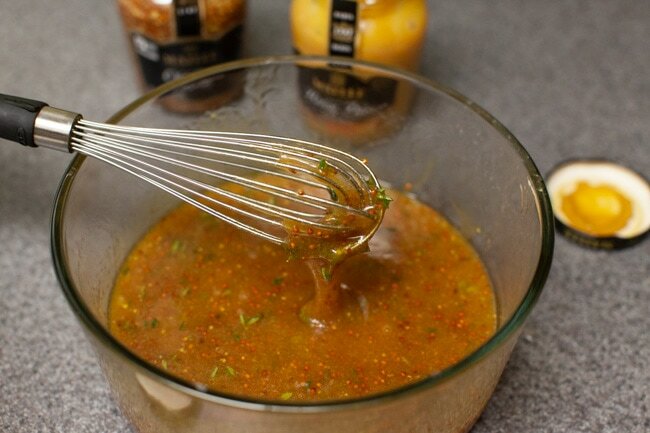 Add the Maille Honey Dijon Mustard. 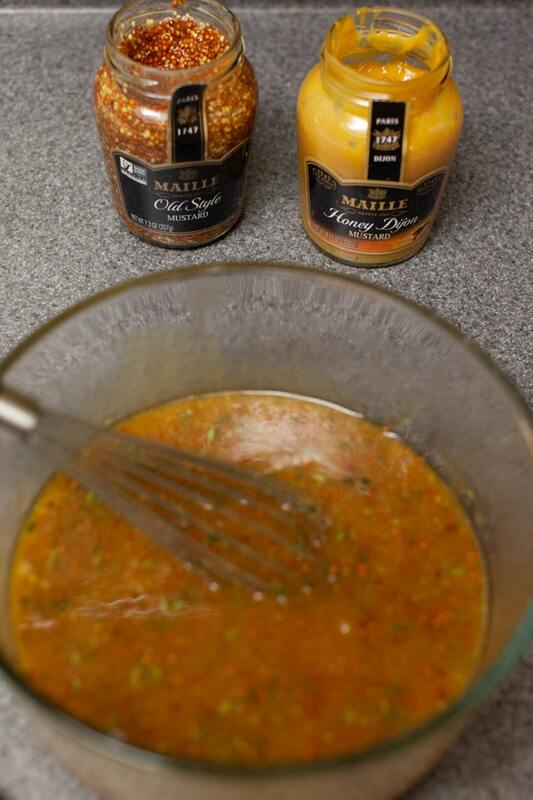 Add Maille Old Style Mustard. 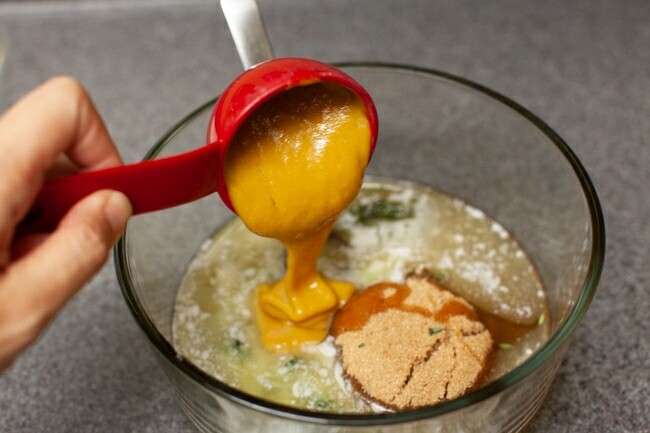 Whisk the ingredients together slowly. 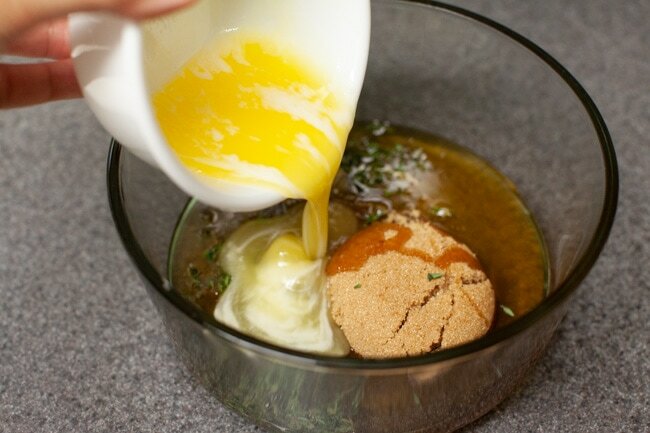 Take 1/3 of the glaze and place in a separate smaller bowl. Set aside. 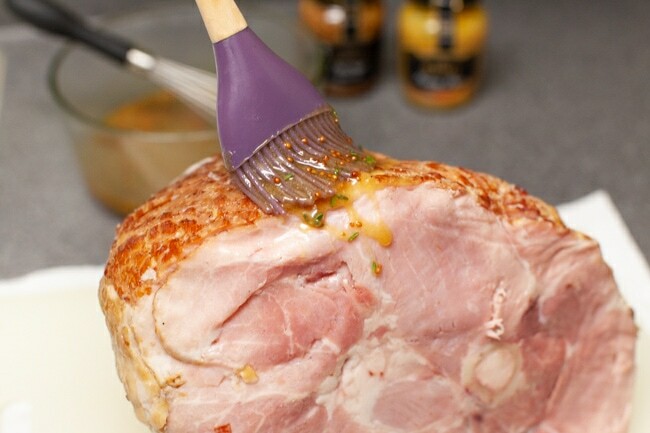 Brush the glaze mixture onto the ham. And in between the spiral cut slices. 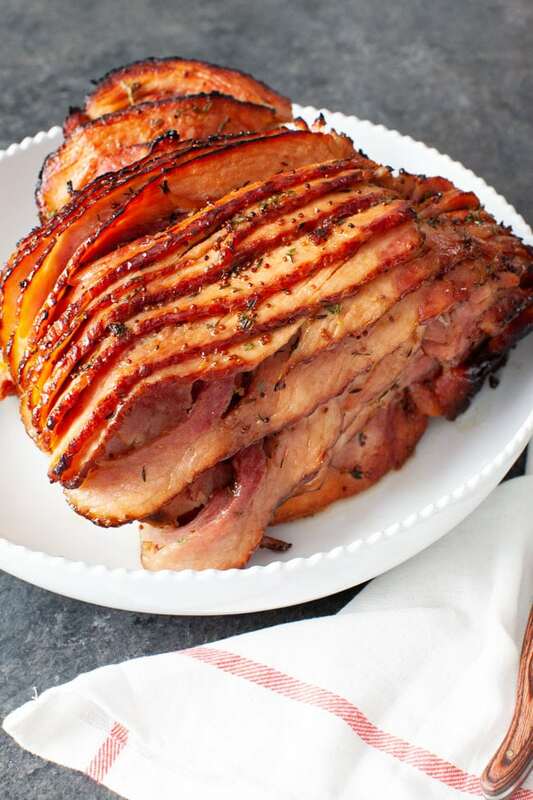 Place ham into the slow cooker on high for 2 to 3 hours or on low for 4 to 5 hours. After it’s done in the slow cooker, remove it from the slow cooker and put it into an oven safe dish. 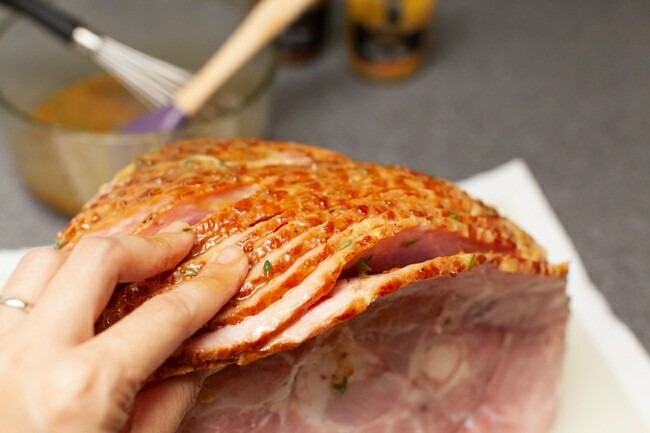 Add the remaining reserved glaze to the ham. Place under broiler in your oven for 3 to 4 minutes. It’s really really easy to make, it comes together so quickly and tastes amazing! 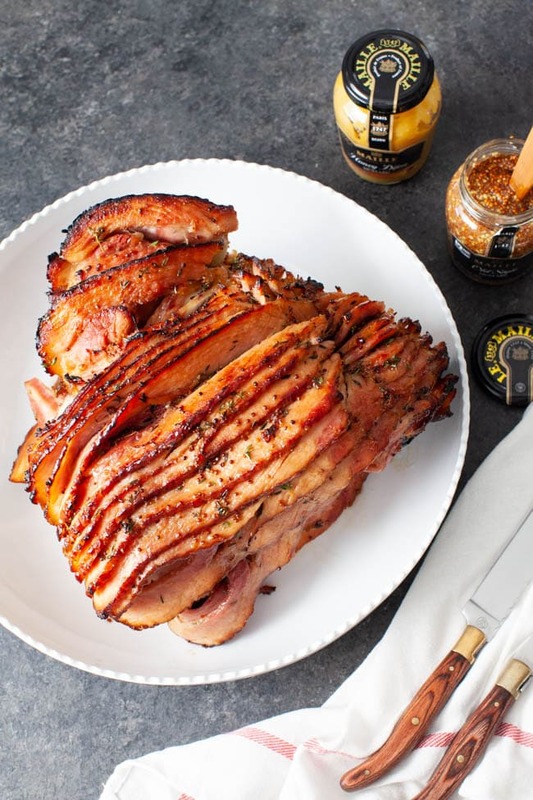 This slow cooker ham recipe using Maille Honey Dijon Mustard and Maille Old Style Mustard will be our new go to ham recipe for holidays like Easter and Christmas! And I love using the leftovers to make ham fried rice! Take all of the ingredients except the ham and mix together in a small bowl. Take 1/3 of the glaze and place in a separate smaller bowl. Set aside. I modified this recipe from Maille for the slow cooker. Here’s the perfect Easter menu for you! 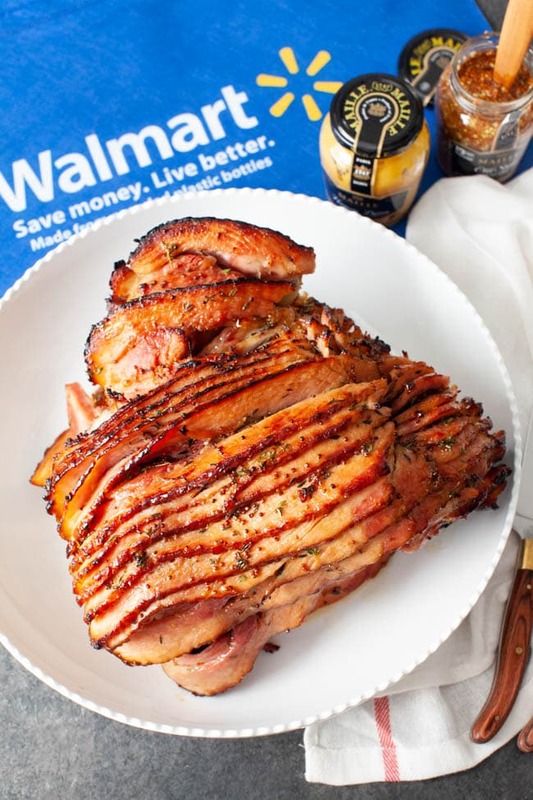 All of the ingredients for this menu, you can find at Walmart! 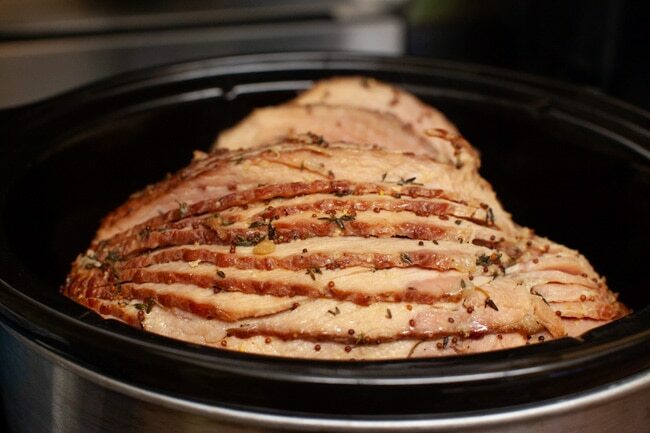 Making the ham in the slow cooker, frees your oven up! Disclosure: This post is sponsored by Mirum. I always share with you my own opinions.